I've had a few emails from TV production companies who are looking for contestants for new television quiz shows. Below are details of a couple of quiz shows that I've been emailed about. My name is Luwam Woldu and I am writing from 1 V 100, a new and exciting quiz show from the creators of Deal or No Deal, coming soon to BBC 1. 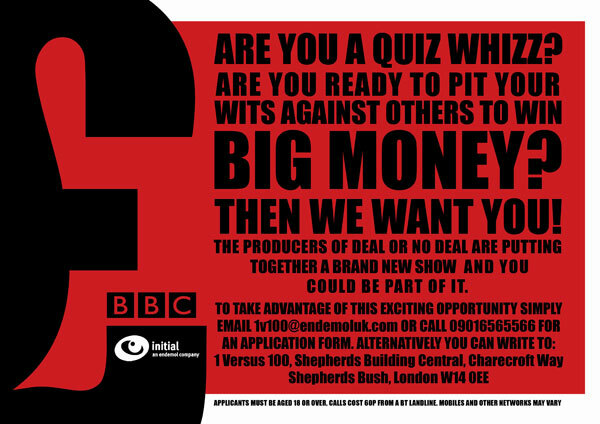 We are currently looking for contestants to take part in this big money prize show and we would love it if you could help us spread the word . I have attached a copy of our flyer below. Anyone interested can apply via the details on the flyer. DO YOU HAVE A TALENT FOR CRACKING CODES OR SOLVING PUZZLES? AND DO YOU FANCY A FOREIGN ADVENTURE� ALL PAID FOR BY CHANNEL 4? The Search is a brand new Channel 4 show taking 10 lucky contestants on an amazing treasure hunt to some of the most iconic and spectacular historical locations on the planet. We�re looking for people who can unravel mysteries, decipher codes and keep up with the pace of this spectacular new show. We want people from all backgrounds with the skills to help them overcome the challenge. You may be an academic from Oxford or a cabbie with a degree from the university of life, it doesn�t matter as long as you�ve got what it takes. CONTACT: If you�ve got a thirst for adventure and you have an engaging personality please go to: or call 0207 985 1944. IMPORTANT: You need to be available for filming from the end of September through to the end of November.